The launch of Maori and Welfare resulted in quite a few interviews (with more to come), and a great deal of discussion on talkback, most of which seemed positive when I was able to monitor it. Disappointingly, but probably not surprisingly, John Key and Paula Bennett ran for the hills. But how did Maori respond? At the launch of Maori and Welfare last Monday, a number of Maori leaders were present and asked questions after I had spoken. I don't believe I offended anyone present; some agreed with my description of the problem privately but there is also a sense off weariness and wariness about what to do. John Tamihere was on the list of expected attendees and I was sorry he couldn't make it. We have talked briefly on radio before and he apparently gave the paper positive publicity on his Radio Live programme the next day. Tupoho say that my paper, Maori and Welfare, is insulting to Maori (Wanganui Chronicle, 22nd July.) It certainly wasn't intended to be. Statistics show that at least half of Maori single parents currently on welfare started on a benefit as a teenager. My opinion is that many young women default to welfare because their alternatives are not bright, having failed to acquire qualifications or skills. The same could be said of the non-Maori population. The Maori teenage birthrate however, is more than three times that of non-Maori and the teenage birthrate in the poorest decile areas is ten times higher than in the wealthiest. A majority of teenage mothers go on welfare and many stay there for years. Long term dependence on welfare has been shown to produce poor outcomes for both mothers and children in terms of education and health. My paper explores the historical discrimination and separatism Maori experienced as a reason why welfare has had a disproportionate effect on that ethnicity. Maori were more vulnerable to the damaging aspects of welfare because they have been historically economically disadvantaged. Welfare incomes can equate to an unskilled wage but they create a false economy. Although money flows into a poor community there is no commensurate economic productivity. People are not engaged in producing goods or services. Communities stagnate. Each year the inflow of young Maori people into the benefit system continues unabated. Stopping that must be a priority for Maori. Hence my suggestion that the DPB be replaced with strictly temporary assistance signalling a strong message that welfare can no longer be viewed as a lifestyle. The paper does not recommend cutting off assistance to those already in the welfare system. It also discusses ways in which Maori could find their own solutions via organisations like Urban Maori authorities if that is what Maori want. There are 6 or 7 suggestions put up for debate. Loans instead of benefits was part of a separate proposal, 'opting-out', which although canvassed, I specifically stated may not best suit most Maori at this time. Even in a recession there are opportunities. For instance NZ has a chronic shortage of childcare yet 50,000 single parents on the DPB have just one child. They could be employed in community or workplace crèches caring for 3 or 4 other children. Before the DPB Karitane hospitals routinely employed young single mums as staff who could combine their child care responsibilities with work. We just aren't being creative enough when we approach the problem of welfare. In my work with beneficiaries as a community volunteer I have seen lives transformed by moving off a benefit and into work. It isn't just about financial independence. People gain a great deal from the purpose and friendships that working brings to their lives. Finally, the paper was extracted from a larger body of work about welfare and the general population. It would be a mistake to give the impression that I consider welfare a problem only for Maori. It is a problem for anybody that gets trapped early and finds getting out nigh on impossible. I cannot accept that anybody believes we do young people a favour by letting this happen. * A "living wage" ordinance, far above the federal minimum wage, for all public employees and private contractors. * A school system that spends significantly more per pupil than the national average. * A powerful school employee union that militantly defends the exceptional pay, benefits and job security it has won for its members. * A powerful government employee union that does the same for its members. * A tax system that aggressively redistributes income from businesses and the wealthy to the poor and to government bureaucracies. Would this be a shining city on a hill, exciting the admiration of all? We don't have to guess, because there is such a city: Detroit, says Jarrett Skorup, a research intern at the Mackinac Center for Public Policy. * In 1950, Detroit was the wealthiest city in America on a per capita income basis. * Today, the Census Bureau reports that it is the nation's second poorest major city, just "edging out" Cleveland. Could it be pure coincidence that the decline occurred over the same period in which union power, the city government bureaucracy, taxes and business regulations all multiplied? While correlation is not causation, it is striking that the decline in per capita income is exactly what classical economists predict would occur when wage controls are imposed and taxes are increased, says Skorup. * Detroit's minimum wage is a whopping $7.40 an hour, more than $2 above the federal minimum wage when it was enacted; and pressure groups are pushing for more. * Additionally, any company contracting with the city must pay its employees $8.23 an hour if they offer benefits or $10.28 an hour if they do not offer benefits. * The city has the highest unemployment rate among all large U.S. cities. Source: Jarrett Skorup, "Detroit: The Triumph of Progressive Public Policy," Mackinac Center, July 6, 2009. Yesterday a group submitted to the parliamentary health select committee about FASD, foetal alcohol syndrome disorder. The first thing that caught my eye in the report about their submission was their targeting of Glen Innes and East Tamaki for education action. That tells us a lot. They have chosen areas where they know drinking during pregnancy is a problem. Suburbs that feature a high welfare population and high teenage birth rate. The second thing I noticed was their costing to New Zealand of FASD as "more than $1 billion each year." This study uses recent estimates that 2.0 per 1,000 live births have FAS and that it cost an estimated $1.9 billion in 1992 to treat infants, children, and surviving adults for FAS and its sequelae. FAS is estimated to occur in 2.0 per 1,000 live births in the United States each year (Bloss 1995, personal communication). It is estimated that during 1992, the cost of treating FAS-affected infants, children, and adults was $1,944 million. Most of the cost associated with FAS treatment is incurred while developmentally disabled persons are either institutionalized or receiving intensive home-based services during their adult years. This estimate does not include other effects that result from fetal alcohol exposure that has not been diagnosed as FAS. So in NZ it is estimated that over 1 percent of babies are born with FAS yet the US estimates the incidence at 2 per 1,000 births or 0.2 percent. These figures are wildly divergent. Which results in correspondingly divergent costings. Yet I can believe that 1 percent (and much more) of mothers drank considerable amounts of alcohol during pregnancy. The US is probably employing a much higher diagnostic threshold ie they are documenting the most severe cases. Getting back to where the problem is concentrated as indicated by where the group is focussing their efforts, "teenage girls and their families" in the poorest areas of Auckland. Around 4,500 females were granted a sickness benefit for pregnancy related reasons in 2008. Two thirds transfer to a DPB. 80 percent were aged 18-24 (an unknown number were younger). I wonder how much of their sickness benefit was spent on alcohol? If society really wants to promote responsible parenting, pre- and post-birth, is putting up cash incentives to anyone with reproductive equipment the best idea we can come up with? Not what you are expecting. 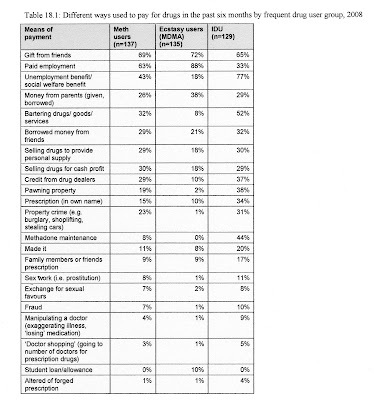 Research from the Centre for Social and Health Outcomes Research and Evaluation shows that from a sample of 1046 frequent drug users, of those injecting drugs in 2008, 77 percent had used an unemployment or social welfare benefit to pay for the drugs; for methamphetamine users the percentage was 43 and for ecstasy users 18. For injecting drug users this was the main way they paid for their drugs. Work and Income cannot compel people on benefits who abuse drugs to accept treatment. Not even if drug and substance abuse is their primary incapacity for being in receipt of a sickness or invalid benefit. The taxpayer, on the other hand, is compelled to fund their benefits. At MJ's request I have removed the original post. She says it has personally identifying details despite my having removed her name before publishing it. Initially she emailed me on Tuesday asking for my qualifications. I responded that I was not University educated. Not satisfied with that response she then asked the same question via my blog creating a strong impression that she was keen to expose what she views as my inadequacy publicly. I have never pretended to have letters after my name. Similarly I have no art qualifications - not even a pass in school certificate art - but because I receive commissions, exhibit and sell my work I describe myself as an artist. This is also, according to one commentor yesterday, unacceptable. I am still waiting for a substantive argument about the content of my paper rather than attacks on my suitability to produce it. MJ, if you do not want your emails to me made public, don't send any. The NZ Business Roundtable today published a paper I penned as part of their Te Oranga o te Iwi Maori project. The media attention has been high and I have gone from one interview to the next and then the official launch. On Breakfast TV tomorrow 6:50. I will link to the paper when it is on-line. Here's the release. A report has been released which recommends the Domestic Purposes Benefit be scrapped and replaced by a shorter-term support package. Researcher Lindsay Mitchell has made the recommendation in her study of welfare policy and social problems among Maori, which was commissioned by the Business Roundtable. Citing the high rates of Maori women receiving the DPB, she says steps should be taken to discourage them from getting pregnant in the first place. Ms Mitchell says to that end, the DPB should be abolished and the Government should only provide support for one year. She says beyond that period financial support should be provided by the child's mother, father and extended family. The report also recommends looking at the introduction of contributory unemployment insurance for workers and a restriction on current universal welfare entitlements. It advises tighter eligibility criteria for sickness and invalid benefits and suggests panels of doctors be used to approve applications as opposed to individual practitioners. Mrs Mitchell believes steps will have to be taken by the Government at some stage - not because it wants to, but because it has to. She says there is a lot of public concern about welfare dependency becoming a lifestyle among both Maori and Pakeha. Mrs Mitchell says the state should provide welfare support only as a last resort safety net. There is little easier than writing policy in opposition. Phil Goff wants the dole paid to people whose partners are working. What a hypocrite. It is Labour's pursuit of means-testing egalitarianism which has left New Zealanders with a tax-funded unemployment insurance system which rips half of them off when push comes to shove.